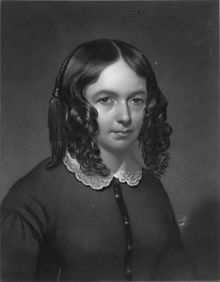 A member of the Barrett family and wife of poet Robert Browning, she was a popular and respected poet of the Victorian era. XXXIII. "Yes, call me by my pet-name!" XLIII. "How Do I Love Thee?" "A Child's Grave at Florence"
"A Child's Thought of God"
Elizabeth Barrett Browning, 5th ed., by John Henry Ingram, 1883. This page was last edited on 28 January 2019, at 04:11.